Ep 37 | EVERY Business Needs The Power Of Search Traffic – Even eCommerce! What’s up everybody? Fred Lam here and welcome to our daily huddle episode number 37. 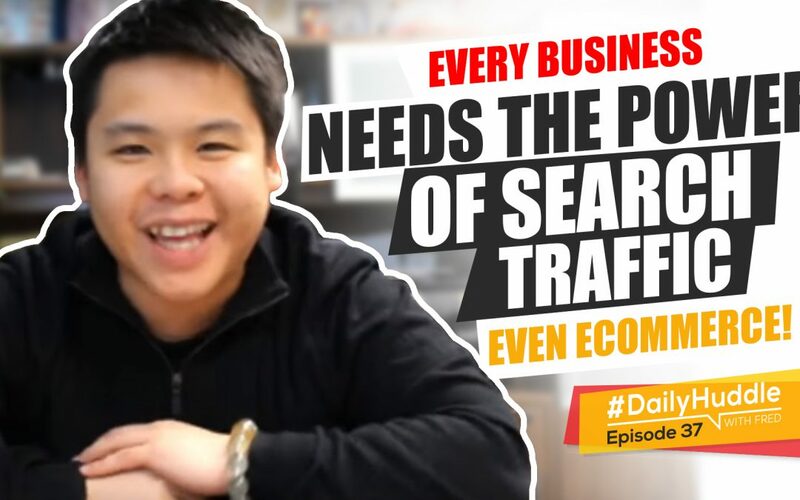 We are officially in episode number 37 and as you guys can see in the title I’m going to talk about search traffic and share with you the importance of it regardless of what form of business you are running. As a matter of fact if you actually know or have a local business search traffic is one of the most important traffic sources that you obviously need to implement in your marketing plan so as in ecommerce. Here’s the deal, if you can get search traffic to convert and scale it up I can tell you, you’ll never hit something called the ad exhaustion and you are going to get a complete sustainable business because every single day a different person actually searches for the key word that you are going after. At the end of the day, it’s not going to be like Facebook or Google display network or YouTube where you are going to serve the ad over and over and over again to the same people and cause ad exhaustion. In this daily huddle I will share more about the search traffic but before I do so I want to first jump into our five questions that have been sent to me today. One of the questions is all about the search traffic and that inspired me to share with you some information that you obviously need to know when it comes to the search traffic, regardless if it is Adwords or Bing you still need to actually look at this and really understand how search traffic works. If you guys are excited about this put in a ME right in the comment box on Facebook and YouTube. [0:03:46] Question 1:1- Should we use Google PPC (search network, display network & shopping campaign) & Bing PPC other than Facebook. Because I think sometime Facebook ads don't work but PPC does. [0:12:18] 1.2- How to adjust PPC bid to optimise the result. What bidding strategy would you use if you a fairly new in this ecommerce. 1- Should we use Google PPC (search network, display network & shopping campaign) & Bing PPC other than Facebook. Because I think sometime Facebook ads don’t work but PPC does. 2- How to adjust PPC bid to optimise the result. What bidding strategy would you use if you a fairly new in this ecommerce. Should we use Google PPC (search network, display network & shopping campaign) & Bing PPC other than Facebook? Because I think sometimes Facebook ads don’t work but PPC does. The answer to the question is YES. In order for you to run a sustainable and long-term business you do not have to depend on one single traffic source. If you have followed me since three years ago when I really started my journey as a digital publisher, I shared the Greek column. What is the Greek column? Let me draw this out to share with you guys. If you go to Greece or in any part of the Mediterranean, you’ll see a lot of structures like this, pretend that this is the top, the roof. This is where your business is. I’m going to call it your biz over here. With this, if you actually treat it like a Greek column and you basically have just Facebook as your traffic. You only have one traffic source to sustain your entire business over here. Now, sometimes you may did something wrong by accident that violated Facebook’s policy or suddenly your ad just didn’t work and you couldn’t find a new creative to get it to convert well when that happens, guess what? This column is actually gone and then your entire roof will actually tumble which means that your entire business will collapse at the same time. The reality when you really want to run a sustainable and a long-term business, you have to make sure that you have multiple traffic sources so that you have more pillars to sustain your business. This looks a lot better. Now imagine yourself, you’re not just relying on Facebook. Let’s say that you have Facebook going, you get Adwords going in terms of search, Bing Ads and you also have YouTube at the same time. When your business has a diverse portfolio of traffic sources, what’s going to happen? If Facebook decides to suspend your account, you lost this traffic source but you still have other three pillars which are still supporting your business. Again, it doesn’t matter if you are running an online business, an offline business, an agency or any form of business which generate money for you. You have to make sure you diversify your traffic portfolio and most importantly have multiple income sources to sustain your business because you don’t want to rely or put all your eggs in one basket. I have seen a lot of people who just focus on one traffic source and when that traffic source got suspended, boom overnight their business is gone. And that’s what you actually should not structure your business to go towards. With that being said let’s be honest in order for you to learn a brand new traffic source it is a little bit hectic. There are a lot of new things you have to figure out, a lot of [inaudible 07:49]. You have to understand the behavior and what you can get from that traffic source and all those other stuff. I want to spend some time today with you to walk you through a little bit about search traffic. Inside your question Bilal, you went Google PPC (search traffic, shopping, display network) yada yada yada. Let me tell you the real truth, when it comes to Google Adwords it is not just basically the entire spill. Google is a lot bigger than you can imagine. Most importantly they have a lot of placements and each placement is there to serve a purpose and a reason why it is there. Let me search ad as an example, I don’t have enough time to cover display, YouTube, Gmail ads, contextual ads and all those other stuff. Today, I’m just going to primarily talk about search. Reflect back the last time that you have performed a search online. It can be Google, it can be Bing. There are two main reasons why you would actually perform a search. Number one, you are basically looking to buy something and you are looking for information. For example, if you want to order pizza tonight and you don’t remember what Domino’s or Pizza Hut’s phone number is, you simply just go to Google and search for Pizza Hut or Domino’s or Papa John’s or Fresh Slice or whatever’s phone number. When you search for that phone number or search for that pizza place you are immediately making a decision on spending money right away. You are ready to pull out your credit card. The other reason that you are going to perform a search is because you have a problem that you want to find a solution to. Like many of you and I would firmly agree. Put in a 1 in the comment box if this false down into your category. When you’re building your Shopify store there are questions which you are stuck on. What do you do? You simply go to Google and search for the answer. You go to the search, you look at the organic listing there’s nothing there but you saw an ad that can actually give you solution to the problem, you’re ready to pull out the credit card to buy that solution because you are a hyper-active buyer. When it comes to traffic, you have to understand the psychology and the behaviour of that traffic source so [inaudible 10:50] you know that the person is actually going to make an action. It will be him pulling out a credit card or giving you an email address to get the answer that they are looking for or to buy the product that they are searching for. With that, that’s what I said even ecommerce is very important when it comes to search traffic. Remember when you are going to buy something, you are going to perform a search on Google to look at the reviews or see if there’s any better pricing or you just don’t know what store or online store sells that product. If someone actually did that search and you’re able to align that product with what the person is searching, boom that’s where the profit actually comes in place. It’s very important for you to actually have search traffic regardless of what form of business you are running; email marketing, digital publishing business, a local business or ecommerce to really support your business and make sure that you are going to build a sustainable business. I hope that really helped you out and gave you a big background about search traffic. Also, letting you know Bilal about basically that you need to diversify your portfolio so your mindset is right. 2. how to adjust PPC bid to optimize the result? What bidding strategy would you use if you a fairly new in this ecommerce? For those of you who are brand new to all this, PPC stands for pay per click. Here’s the deal when it comes to Bing Ads and Google Ads which is Adwords for PPC, it is kind of different. There’s a difference in setup in terms of the bid because of how the system works. For Bing, you can actually put whatever budget you want. You need to understand this is auction-based so whoever has the highest cost per click will actually win that ad space but you have to make sure that you are generating profit from every single click that you get. It doesn’t matter on what average position you get on Bing, what matters the most is that if you are turning that click into a sale. If you are able to make profit then you’re going to be good. You have to understand what your cost per click is or what your PPC is going to cost you and you have to know what your earnings per click (EPC) is going to be. Let me tell you an example, let’s say that if I make $2 a click through my sales funnel that basically gives me room to advertise on Bing anywhere under $2 I’m going to be in profit but from there, it’s basically a decision up to you. Let’s say that I’m getting an average position of a three at $1.50 cost per click that means that I’m making $0.50. Now, an average position of three you will know that you are going to get a lot more clicks than being on an average position of like four, five and six but because you are paying $1.50 you are going to get more clicks and you are going to make more of $0.50 profit per click. When you go like, “Well, at the end of the day I want to keep more margins.” You can do that. You can bid a buck and it may push you down to average position of a five or six then you make $1 right in between but at the end of the day less traffic because your ad rank or where your ad is going to be further down. So, you have to do the balance yourself on do you want volume or do you want more margin and you decide from there. That’s really what Bing does. If you’re trying to go after search campaign on Google, one of the most important things that I always do is I always bid higher. The reason why I always bid higher is because of the quality score system. Inside Google there’s a quality score system that assigns a number to every single keyword that you are going after and one of the factors is basically click-through rate. Like I said earlier, the higher your average position is going to be, the higher click-through rate is going to be because you’re going to get more clicks, right? Obviously, it’s the same page if you’re on position three you’re going to get more clicks than position number six. Even though it’s the same ad position number three is going to have a higher click-through rate because it’s higher but because of that higher click-through rate Google is going to reward you of a better quality score system. Right out the gate when you’re advertising on Google, you have no history with them, you have no data with them then you’re [inaudible 15:42] into a sandbox. In order for you to be in the sandbox basically Google is filling you out, testing you out, knowing your business a little bit more and getting pixel data. Then you have to get out of the sandbox quickly and in order for you to do that to get a lower cost per click you have to bid higher. We call this bleeding. You have to bleed some money right out the gate to get you outside of the sandbox so you get a higher quality score and then your cost per click will actually drop down. Again, it is an art when it comes to Google. There are a lot more things in there that meets in the eye and at the end of the day if you are a Zero Up member you have the entire training on it and all those other stuff. I’m actually built for Google. I love Google. Before even Facebook ad platform exist I’m like all in on Google that’s why I know all these stuff. I’m going to release more video training about this because it’s going to take me forever to explain this. I may lost some of you only because I know that by talking to you about it I may lost many of you already. For those of you who got it put in the number 8 into the comment box if you learn something valuable just now about the search traffic. I even gave you basically some of the strategies. Bilal, it’s all about you, what margin you want to make and you basically handle or adjust the bid based on the position and based on you profit margin. [0:17:45] Question 2: Does facebook automatically adjust your audience or do you need to delete it and create another audience? Hi Fred, Thanks for sharing your knowledge with us, I finally start seeing some sales! My question is, when making a custom audience base on 100 visits to one product, do you need to delete the audience and remake it once you are getting more than visits? For example I run a custom audience at 100, then a week later I got 1000 visits. Does facebook automatically adjust your audience or do you need to delete it and create another audience? NO! Once you’ve created your custom audience once Eddyie, then it will just keep adding on top so you only need to create it once. Facebook will automatically adjust it for you so you don’t have to worry. Even Google you only have toset upp your marketing audience once and then Google will keep adding it to your list on a daily basis. Good question that you brought this up. Facebook algorithm changes constantly. I’m not sure which YouTube video you have watched from me. I was told and a lot of people verified this information with me and even my Facebook reps said that when it comes to increasing your adset’s budget you don’t have to increase it more than 20 to 25%. If you d more than that then it will reset the algorithm and you don’t want that to happen. Let’s say that you’re running $10 a day campaign, you’re getting phenomenal results and you’re going after a million audience size that will give you the ability to run several hundred dollars a day and you want to go from $10 to $100 if you’re doing that then YES, you have to duplicate the adset and start right out the gate with a higher budget. But if you’re trying to change the ad budget within the existing one, don’t go more than 20 to 25% because at the end of the day it will reset the algorithm and after you have gotten the 20 to 25% increase you have to get some sales rolling for a couple of days before you can increase another 20 to 25%. That’s the ideal way of doing it. [0:20:46] Question 4: Is it ok to use Video ads posted by the seller on aliexpress for my store? The fourth question is by Miks Casal. Hi is it ok to use Video ads posted by the seller on Aliexpress for my store? The answer should be a YES but obviously do your due diligence, contact the vendor and ask them for their permission just in case that you don’t get into any trouble. But from what I know the answer is going to be YES. [0:21:08] Question 5: Is there a difference between a landing page and a sales page? They sound interchangeable but sometimes when people talk about them, they sound like different things. Is there a difference between a landing page and a sales page? They sound interchangeable but sometimes when people talk about them, they sound like different things.. Landing page and sales page, it can be the same and it can be different and here’s why. Landing page is classified as the first page that your visitor will visit. That’s what they call landing page. It is basically when you direct that traffic source so it’s not people going to your website. It is when you advertise or when you post organically in social media or when you send an email out. When someone actually clicks on your ad, your links and the first page that loads is called a landing page. On that landing page, it can be different things. It can be an opt-in page, application page, lead generation page, product page, pre-sell page. It can be all forms of pages. When it comes to a sales page, it is a page that asks for the sale. Pretty simple, sales page is all about the sale. An opt-in page will not be classified as a sales page because in the opt-in page is the top of the funnel, you’re asking for an email address. You are not asking for the sale yet. On the sales page is when you actually ask for the sale. A product page can be a sales page? A written sales letter that asks you to buy a video sales letter (VSL) is also a sales page because those pages are pages that you are asking the person to purchase something so when they click on your sales page, usually we direct it to an order form and they fill out the credit card information from there. That’s the main difference. I hope that really helped you out and get you unstuck about landing pages and sales pages. Guys, here’s what I want you to do. I want you to make sure that if you are on YouTube make sure you click on that bell and join our notification squad. This bell once you activate it, each time I come on live or when I release a video training, you are instantly going to get an email from YouTube to come on live with me or be the first person to watch my video training before anyone else does. Listen, on social media it’s going to be the best part where you get the most updated information right away, even before my emails. My emails are usually one day delayed because I have to write the email, send it out etc. But if you are on my social media, you always get the first most important update. If you are on Facebook make sure you head over to YouTube, search for Fred Lam and then click the subscribe button and make sure you join our notification squad by simply clicking on that bell icon to be informed of what is happening. Also, here’s the deal. We are now officially in 2018 and to start things off, next week on Monday I have something to share with you guys that will completely blow you away. Like I said in yesterday’s episode number 36, talking about the three-core business models that I believe will keep growing and it’s going to be very important for 2018. I’m going to partner with a very dear friend of mine who has done 8 figures a year. We are releasing a boot camp together next week so it’s going to be a free video training series to get your butts off the ground and start creating a business. If you are on ecommerce already, great, focus on it but if you want to look at another business model, this is something that you definitely need. So make sure you are here with us and in my email so that you guys get the link to sign up for a free access to a boot camp where you can start building a business. It’s going to walk you through on everything that you have to do, understand the business model and then if you are interested in it you can take action. For those of you who are debating is ecommerce right for me? Or shall I look for another business model, guess what? It’s going to be the perfect time for you. Put in the word BOOT CAMP right into the comment box on Facebook and YouTube if you guys are excited about this. It’s going to come out on Monday. I’m going to build the hype up, I’m going to make you wait and anticipate for it. I want you guys to tell everyone about it because there’s going to be a new boot camp releasing 8 long videos about a business model. You can learn about it, understand it and if it’s right for you then it is something that you can look into further. If you guys love my 10-part video training series for Zero Up Lite, I would bet you, you are going to absolutely love this boot camp that is going to be released. Make sure you subscribe to my YouTube channel, follow me on Facebook, and open every single email that I sent you to get these forms of notifications. Other than that, that’s really it for today. I am super excited to have every single one of you. I am definitely looking forward for 2018 with every single one of you. All I’m going to do is provide as much value, as much content and give you as much resources as possible for you to start breaking through in 2018. I’m going to hold you accountable and this year is going to be your year but what I need from you is to take action, listen to what I’m telling you and most importantly to join us every single day in our daily huddle. I usually come on at around 6 PM Pacific, 9 Pm Eastern except for Thursdays because I have an exclusive webinar just with my members only. If you want your question to be featured in our daily huddle, make sure you go to www.fredlam.com/ask or simply click the link above this video on YouTube, fill out that question form and I’ll get your question featured in our daily huddle. That’s it for today guys. Keep hustling, go, go, go and I look forward on hearing your success story. If you are getting results like Eddie, he is starting to get sales but he started from zero tell me about it. I love it. If you guys have time shoot me a video so I can see who you are and familiarize myself with you. Other than that, I’ll see you guys tomorrow. Tomorrow is Thursday so I will be on 9PM Pacific and midnight Eastern. Talk to you soon. Bye now.